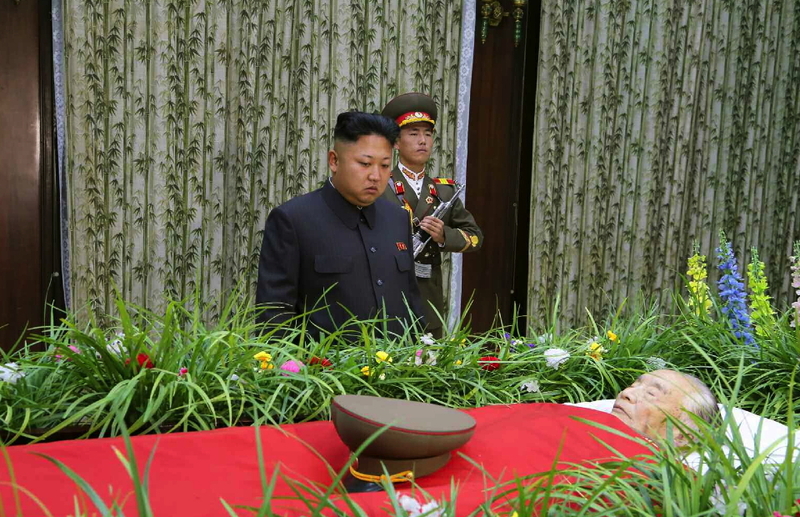 Kim Jong Un stands in front of Jon Pyong Ho’s casket at the Sojang Club in Pyongyang on 9 July 2014 (Photo: Rodong Sinmun). 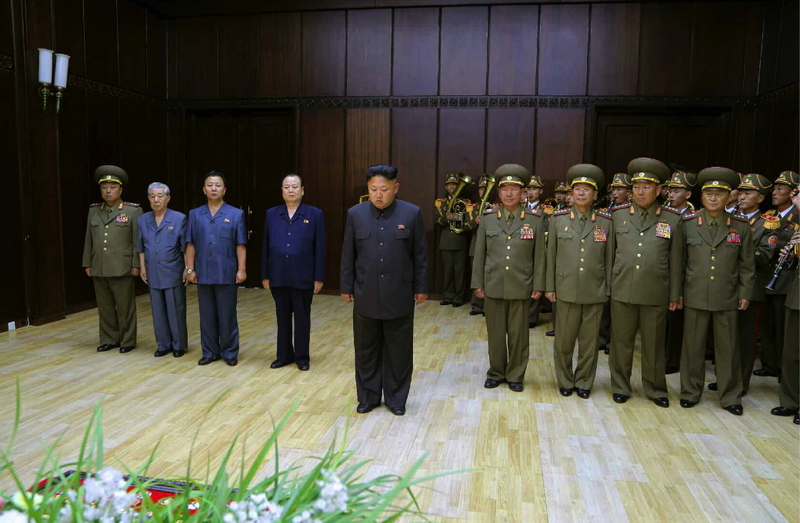 Kim Jong Un (Kim Cho’ng-u’n) extended his condolences at the wake of former Workers’ Party of Korea [WPK] Secretary for Munitions Industry and National Defense Commission Member Jon Pyong Ho at Sojang Club in Pyongyang on 9 July (Wednesday). Accompanying him were Hwang Pyong So (Director of the Korean People’s Army [KPA] General Political Department), Gen. Ri Yong Gil (Chief of the KPA General Staff), Gen. Hyon Yong Chol (Minister of the People’s Armed Forces), Pak To Chun (WPK Secretary for Machine-Building Industries; Jon’s successor), Col. Gen. Yun Tong Hyon (Vice Minister of the People’s Armed Forces), Jo Chun Ryong (Chairman of the Second Economy Commission), Ju Kyu Chang (Vice Chairman of the Second Economy Commission) and Choe Chun Sik (President of the Second Academy of Natural Sciences). 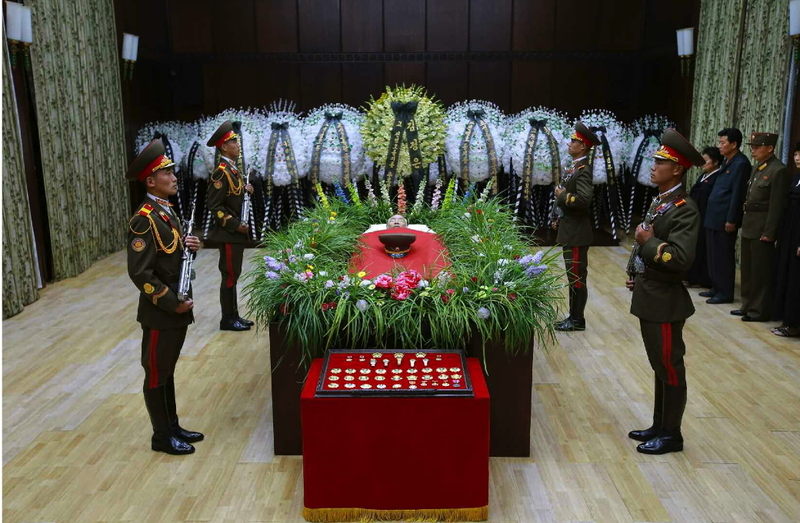 Kim Jong Un and senior officials of the Korean People’s Army and the Workers’ Party of Korea pay their respects in front of Jon Pyong Ho’s casket in Pyongyang on 9 July 2014 (Photo: Rodong Sinmun). In attendance with Kim Jong Un were: Lt. Gen. Choe Chun Sik (1); Ju Kyu Chang (2); Jo Chun Ryong (3); Pak To Chun (4); VMar Hwang Pyong So (5); Gen. Ri Yong Gil (6); Gen. Hyon Yong Chol (7); and, Col. Gen. Yun Tong Hyon (8) (Photo: Rodong Sinmun). 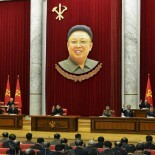 Jon Pyong Ho lies in repose at Sojang Club in Pyongyang (Photo: Rodong Sinmun). This article was written on 09 Jul 2014, and is filled under 2007-2010 kpa management, 2nd Academy of Natural Science, Central Committee, Central Military Committee, Choe Chun Sik, Col. Gen. Yun Tong Hyon (MPAF), colonel general, Events Management Section, Gen. Hyon Yong Chol, Hwang Pyong So (GPD; KPA VMAR), Jo Chun Ryong, Ju Kyu Chang, Kim Chong-un inspections, Kim Family, Kim Jong Un Visits, Kim Jong-il, Kim Jong-un, KJI Personal Secretariat, Korean People's Army (KPA), Korean Workers' Party (KWP), KPA General Political Bureau, KPA General Political Department, KPA General Staff, Machine Building Industry Department, Ministry of the People's Armed Forces (MPAF), MPAF GPB, National Defense Commission (NDC), North Korean press, Pak To Chun, Party elders, Political Bureau, Propaganda and Agitation Department, Second Economic Committee, Second Economy Commission, Secretariat, State Security Department.